I have wanted to make a page in honor or my husband's hobby, GEOCACHING, for awhile. I will start with listing a few links and webrings. WHAT ARE TREASURE HUNTING CRAFTS? Crafts used in activities for the incredible world wide hobby of treasure hunting clubs/groups/individuals called geocaching, letterboxing etc. WHO WILL LIKE GEOCACHING OR LETTERBOXING? Families, scouts, teachers especially computer science, math, science and gym teachers possibly English teachers if people make and keep real journals, crafters, rubber stampers and more! I will not try and explain the purpose of these groups, their webpages explain them better than I can. But as a crafter, wife of a geek and mother of two boys (both crafters but potential geeks) I had to get involved in their fun. The boys and my husband often take my husband's GPS (Global Positioning System) hand held electronic "Big Man's TOY" and go out in nature and hunt for caches. What is in the cache is really not important. Often no real "treasure" but a great way to mix nature, exercise and family bonding. OK... I admit it .. I don't often go with them. I won't make excuses but I can't always keep up with them... But they have gone on many hunts. They have done this in many different cities and states we have visited. We will soon be making our own cache, so I thought would start this page and share our projects. While looking online for ways to make a cache, I came across another site and treasure hunting group, LETTERBOXING. Here I found my chance to really get involved with the family fun. Letterboxers may or may not use GPS's but they use clues and make treasure boxes that include the use of RUBBERSTAMPING! Many even make their own rubber stamps. So of course this got my interest. To get started in letterboxes see letterboxing.org's getting started. While visiting my in-laws in Cleveland, they also came across a new aspect of geocaching for us ... TRAVEL BUGS. We all got real excited about partipating in this added geocaching project. It is a toy car that has been labeled with a name and code. If you take it from the geocache you are responsible for moving it to another cache and reporting on the web where you moved it. Many families get involved in a competition where they "race" the multiple tavel bugs across the country. To make it more challenging they give points for miles it moves or other things the owner wants to track. The bug we found's owners were in a family competition. Points were given for finding streets with their family names, extra points for pictures of the street signs, your picture and more! We took the bug from Cleveland Ohio and brought it to Newport News, VA. As we post our finds on the web, we were able to follow this bug around even after we left it. It traveled around Virginia and North Carolina to Hawaii. They sell kits for a very reasonable price to get you started with travel bugs and making all of the instructions and labels water proof. Tools you will need will vary. Geocaching usually means you need a GPS. 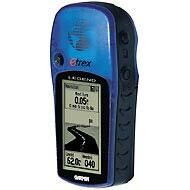 For suggestions see: geocaching.com's guide to buying a gps. There many companies and models. Prices range from aobut $90 to hundreds of dollars. Many people of course buy GPS to find their way around the world. Finding directions to local places or to map their trips. The military use this as a real tool. But we also can have fun with it. The fun for the family of course can justify for the buyer why the family REALLY needs this tool/electronic gagdet. We really did find it useful many times on our driving trips. It was great when we were stuck in traffic in a city/state were were not familiar with. Instead of frustration and road rage, we got off the highway and used the GPS to find a parallel road! No GPS or Scout needing to earn a badge for using a compass? Use Map Quest or the Geocache sites to get the coordinates and use a compass when you get there. The letterboxing sites even tell you how to make your one distint rubber stamps. But of course you can also go to my Supply pages and my Jewish Resources pages to find sources to buy rubber stamps and even Jewish rubber stamps. For letterboxing and sometimes for geocaching. If you want to make your own catche. See geocatching.com's: suggestions on making your own cache and how and where to hide a cache. The instuctions include information sheets to include inside your cache to explain to people what they have found, possibly by accident. These instructions are available in about 20 languages. Helpful but not necessary, a digital camera, scanner or pictures on CD. Only needed if you want to upload pictures of your finds, self etc for travel bugs or to give picture clues of where to find your cache. It is just something fun for the finder. People take one or more things and usually replace them with an equal number of objects. How I make our geocache box. Making my own stamp and box for letter boxing. If the crafters reading this have some geocaching/letterboxing crafts of their own they want to share or a web page they want me to link to then email me. Geocaches are also encouraged to clean up nature while hunting. The site will even post pictures of your efforts. There are geocaches in 165 countries. Hass 4648 Clues onlin in 50 States and 8 Countries. Letterboxing North America Webring. 95 sites and growing!